The first reaction, after gradually hearing of the extent of the damage, was to see where help was needed. This was the morning of June 4. Assistance was being directed from my church, First Presbyterian. Helpers were assigned congregation members whose conditions needed to be verified. We found the immediate need was for dry ice, which was collected and distributed. That grew into helping feed workers and victims at that location. Food and supplies were donated by grocery stores and restaurants that had no electricity or suffered damage. A few days later, I was contacted by the American Red Cross to volunteer at the One-Stop Center, now called Disaster Assistance Centers, at Central Catholic High School. All relief agencies had representatives there, from insurance to individual family grants and temporary housing. I was then hired by the Grand Island Interfaith Disaster Relief Organization as the director. The American Red Cross building had been severely damaged. Administrators moved to the basement of the former School of Nursing. 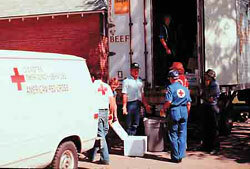 I have been with the American Red Cross as a disaster nurse ever since. The day of the June 3 tornadoes brings back lots of memories for us. The day was warm and windy, but there was something in the air that made everyone feel uneasy. That evening, the clouds built up, and the weatherman told us we were in for some severe storms. Soon, there were more storm warnings, and finally he announced that there were several tornadoes approaching the city and to take cover immediately. Since we had lived in Scottsbluff for quite a few years and had had many tornado warnings there, we knew what precautions to take. Our son helped us gather the radio, some water, flashlights, etc., and we all headed for the basement, along with our dog. We spent the next few hours on the floor with a mattress over our heads. We couldn't decide which was worse -- when the wind howled or when it was so quiet. It made us feel very apprehensive. It seemed like the sirens were blowing all night, but we finally were so tired that we fell asleep. At 6 a.m. the next morning, our phone was ringing, and the Red Cross said they needed us at Stolley Park School to help the tornado victims. All three of us jumped into some clothes and made our way to the school. The Red Cross was already there setting up a shelter and making sandwiches and coffee. We didn't realize how bad the tornadoes were until we tried to take some travelers to the motel they had been staying in. It was destroyed, and debris was scattered everywhere. These poor people were trying to find their car and some of their belongings. When we got back to Stolley Park School, we could see that a larger place to prepare food was needed and that we had a huge job ahead of us. Les had access to the schools' central kitchens. Out of the three kitchens, only the one at the old Walnut school at Fifth and Elm streets did not suffer damage, so the Red Cross set up headquarters there. We opened the kitchen and got on the phone to call for volunteers from the school food service personnel since they were familiar with preparing large quantities of food. They, along with many volunteers, prepared meals to serve in the cafeteria and to transport in vans to the disaster areas. There was no shortage of donated food. Water, soft drinks, food and help came pouring in from so many different places. We were overwhelmed by the generosity of the people. Many businesses, organizations, individuals and even people from the surrounding towns came with their arms, cars and trucks full of donations. We could never have fed all those hungry people without them. With the help of Selma Shamberg, a dietitian, menus were planned, and the cooks really went to work! We served food to anyone who needed a meal and tried to provide food wherever it was needed. Red Cross vans and volunteer drivers and helpers loaded food into the vans and headed for the disaster areas to provide meals for victims and workers who were helping with the cleanup. The vans were kept busy serving coffee, doughnuts and fruit in the morning, a noon meal, soft drinks and snacks in the mid-afternoon and the evening meal. We did this for a total of 10 days, and although we can't recall the number of meals served, we know it was in the thousands. It would not have been possible without all the generous amount of time volunteered and all the donations that were made. Thankfully, we had no damage to our home, but since we didn't have water and electricity for a short time, we chose to travel to Ravenna to stay with my mother. A hot shower when we got to her house was really appreciated. Since no one could come into Grand Island without a permit, we carried a pass so we could get into the city each morning. We put in many long hours from 7 a.m. to 8 p.m. each day, but it was worth every minute of it. This was the beginning of our Red Cross affiliations in Grand Island. Since then, we have moved to Ravenna. We miss all the friends we made, all the informative classes we took and especially all the doughnuts we ate. We hope there will never be another disaster like this again, but if there is one, we would be some of the first people there to help again. My husband, daughter and I spent the night in our basement. Early in the morning, the Red Cross called. I was not surprised, knowing that the National Guard had been called out and the situation was bad. At that time, I was canteen chairman, and our disaster program was not as well-defined as it is now. Frank Richter was in charge, and I handled the feeding. Not knowing whom to call except our neighbors, we rounded them up and went to Stolley Park School, where headquarters had been set up. Others also came over to the school. We needed water, so I had someone go to Riverside Golf Club and get water from their outdoor hand pumps. We had a generator and were able to make coffee. We went to local stores to obtain sandwich materials and thus set up sandwich making in a manner we had used at the bloodmobiles. This was a start. The national disaster professionals were here. They took over the logistics, but we handled the volunteers and the food donations. Back to the first day -- Gillette Dairy from Hastings brought over a large refrigerated truck with bottled water, which our volunteers delivered to people all over Grand Island, Kuester's Lake and beyond. None of us thought we were doing anything special. We were so grateful that we had not suffered the losses that so many had. My daughter, home from college, worked mornings, than either helped cook or deliver meals. This is the way the community responded. I honestly did not have a chance to look over the damage for several days as I was too busy trying to coordinate things. Around 7:30 p.m. on the evening of June 3, the tornado sirens started to sound and continued to sound at various times until 10 p.m. The clouds kept building up and getting darker and darker. We went to our shelter sometime after 9 p.m. We heard a sound like a freight train, so I closed the door on the shelter. The tornado passed near our house, taking the hay shed but leaving a car undamaged. Tree limbs were down all over the yard, and some trees were broken off. The house was pushed and it slid on its foundation. The next morning around daylight, I drove into town to see if I could help out. The first thing I noticed when I got to Meves Bowl was that it was gone. So were a lot of houses in the area, and in fact, I did not know for sure where I was due to the damage. My wife drove to Lincoln to get supplies from the Red Cross office, and I started driving a Red Cross van delivering food, water and pop to the people in the damaged areas. We were without electricity for around three weeks, so we had to drive to my mother-in-law's farm to get water. She was outside of the damaged area.